Osteochondral defects of the knee are a common source of knee pain, swelling and discomfort in children, adolescents and young adults. Osteochondral defects (OCDs) are diseased areas of bone (“osteo”) and cartilage (“chondral”). There are two main types of Osteochondral defects. Traumatic, which are normally as a result of patella dislocation or injury to the knee joint and Osteochondritis Dissecans, which occurs typically without a history of trauma and may affect both left and right knees. 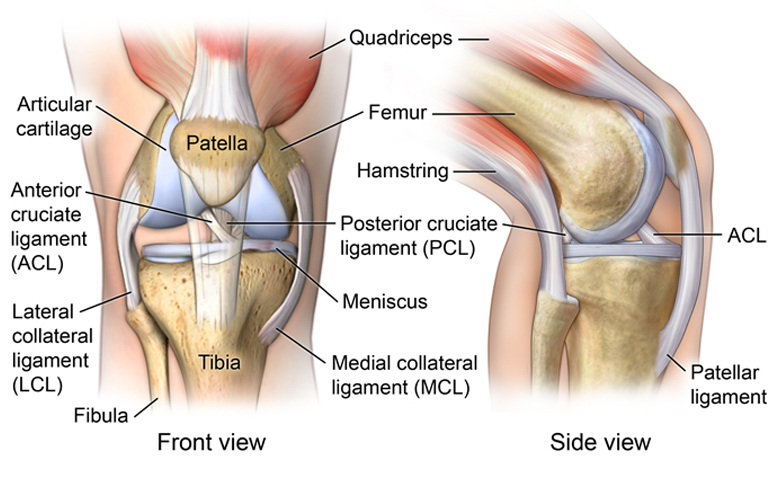 Normal knee anatomy is composed of the femur (thighbone), tibia(shinbone) and patella (kneecap). These are covered with a layer of cartilage which provides a smooth and slippery surface to allow movement through the knee joint. The cartilage is strongly adherent to the underlying bone, and it cushions the impact during walking and running. If healthy cartilage is damaged, a rough surface forms which causes the knee joint to degenerate and wear out (arthritis). Normally the cartilage of the knee is strongly adherent to the underlying bone in layered ‘zones’ (above).